A worrying knee injury to new signing Danny Fox capped a thoroughly miserable night for Wigan Athletic, who were left flat as a pancake by a dramatic Derby comeback. Despite leading 1-0 at the break through Gavin Massey, Latics were pegged back just after the hour mark by Mason Bennett’s worldie. Latics even saw what would have been a decent point slip through their fingers when Scott Malone popped up with a 78th-minute winner. And boss Paul Cook revealed his fears over Fox, who had to be helped from the field after barely half an hour. “It doesn’t look great for Danny at the minute, his knee’s in a brace,” Cook grimaced. 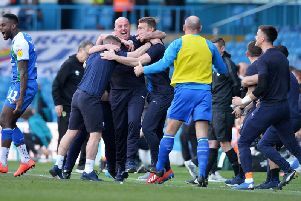 Despite a hugely encouraging display for over two-thirds of the game, the Latics boss was in despondent mood as he boarded the coach back to the north west. “I’m not one of these who takes much in the way of positives from a game like that,” he admitted. “We’re going home with nothing so there’s nothing to be positive about for me. “We felt their equaliser came at a point when we were at our most comfortable in the game. “We’d managed to weather everything they were doing, in terms of tactics and personnel. “I haven’t seen their equaliser again, but it’s either an absolutely fantastic goal or a little bit lucky. “That’s football, and it completely changes the mood and the momentum inside the stadium. “They become buoyant, they get on the front foot, and unfortunately we couldn’t see it out. “I felt we could have scored a second goal, Derby looked open, they were coming on to us like we wanted them to.